Engage and challenge your students during Arthur Miller's drama "The Crucible" with this huge bundle of resources designed with student engagement and critical thinking in mind. 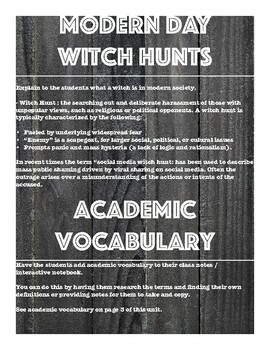 This listing is for a 15 day unit that walks you through the entire documented research essay writing process with your students after reading Arthur Miller's "The Crucible". 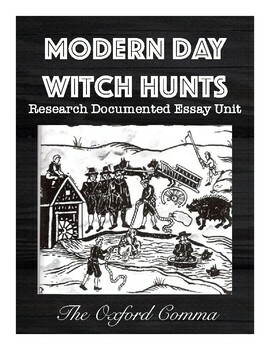 Have the witch hunts from Salem come to an end? Let yours students work through this unit to find out. 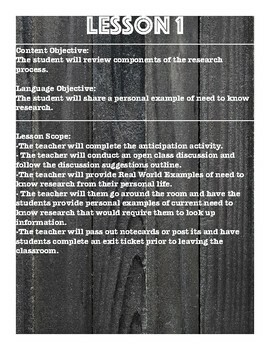 The unit includes daily content and language objectives, academic vocabulary, printables, 15 days worth of lesson outlines, anticipation activity, discussion suggestions, real world examples, student handouts, 2 revise and edit activities, and suggestions throughout the entire unit. 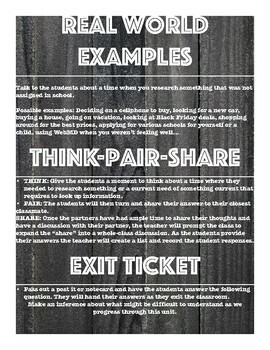 I have used this resource in my own classroom, so I know it works!